Byron Bay - Gold Coast region accomodation priced from $150 per night, and under $250. Ballina, Kingscliff, Tweed Heads, Mullumbimby, Northern Rivers of NSW and South East area of QLD, Australia. 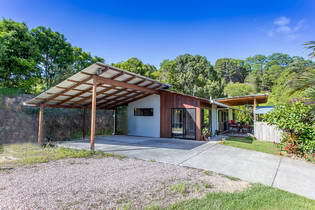 Byron Bay, mid range accomodation, Gold Coast, affordable accomodation priced less than $150 per night. From Byron Bay beachfront to Gold Coast rainforest, this accommodation offers overnight to weekly rates, and may also offer medium term and longer stay options by arrangement, for those who want a home base to explore the region on extended stays. Choose from waterfront holiday apartments in popular beach destinations and quaint seaside villages, or country cottages and rural retreats where you can relax and enjoy the natural surroundings, priced between $150 to $250 per night. Choose from selected mid range accommodation below via Booking.com*. Click the business names to go to Booking.com listing. Located on the riverfront, Ramada Ballina offers rooms with spa baths and suites with a kitchenette. All air-conditioned accommodation has modern furnishings, flat-screen cable TV and water views. Guest facilities include fitness centre, outdoor swimming pool and children's swimming pool, 24 hours reception, room service and 3 waterfront restaurants serving modern Australian, Italian and Indian cuisines. A beautifully furnished open-plan studio ideal for couples. Enjoy a round of golf, fishing by the creek or swimming in the pool. Get aquainted with the farm animals, spend time exploring the gardens, canoeing on the creek or simply relaxing on the verandah with a book. French restaurant located across the road. Set on 20 hectares of views and wildlife galore, choose from air-conditioned twin, double and family rooms with a shared bathroom. We aim for the most comfortable, spoiling and profoundly tranquil experience, offering massage, spa treatments, natural therapies, yoga, meditation, and more, as well as an on-site restaurant providing home grown, homemade, delicious vegetarian meals. Located in the Scenic Rim and nestled on 323 hectares (800 acres), the resort features an 18 hole, par 72 golf course, outdoor swimming pool, day spa and wellness centre, private airstrip, and a host of onsite activities including horse riding, skydiving, mountain biking and unique Australian experiences. An onsite cafe and 24 hour buffet and à la carte restaurant and 24 hour room service is available, with golf "Stay & Play" packages including breakfast. Guest suites include a flat-screen HDTV, mini bar, microwave, mini-refrigerator, coffee maker, and sitting area. Lennox Beach Resort is just 100 metres from Seven Mile Beach. All apartments boast large balconies, some with fantastic ocean views and a private spa bath. Guests have free WiFi, and all apartments are air-conditioned, with a fully equipped kitchen, laundry facilities and a TV with free cable and movie channels. Guests can dine at iWok, a Chinese and Asian cuisine restaurant and there is a bar open for lunch and dinner daily. Offering free Wi-Fi and included buffet breakfast, Cedar Creek Lodges are situated on the 112 hectare Thunderbird Park. Guests have access to a tennis court, with mini golf, hiking, horse riding and laser skirmish other optional activities. Massages, yoga and Tai Chi lessons available by prior arrangement. There's an onsite bar with nightly entertainment, a restaurant for dinner on Friday and Saturday nights, and daily lunches are available from a cafe. 3 minutes walk from the beach, Mantra Twin Towns features 2 swimming pools, a hot tub, tennis courts, fitness centre with steam room, and outdoor barbecue areas. Rooms have a private balcony with views of either the beach, the Tweed River, the hinterland or Coolangatta. All hotel rooms and apartments include cable TV. Apartments with full kitchen facilities are available. Free internet access and Free Wi-Fi available. Restaurant offers a full buffet breakfast each morning and a light meals menu. Situated on a working Macadamia Nut Farm, Odermatt Farm Stay is surrounded by 5,500 trees over 88 acres. This 2 bedroom holiday home offers a patio, a fully equipped kitchen and free on-site parking.